When you choose to get a dog, you must choose to become a responsible dog owner. Unfortunately, not all dog owners act responsibly, abandoning their dogs when they become inconvenient. The most irresponsible of dog owners will leave dogs to fend for themselves in a vacant home or chained in a yard. This is tragic and unacceptable. It's also illegal to abandon your dog in most areas under animal cruelty laws. You cannot just get rid of your dog. It is your responsibility to make sure your dog is cared for properly. Sometimes life gets rough and we have to make serious choices. In some cases, that means giving up a beloved pet. However, there are many ways to avoid this. 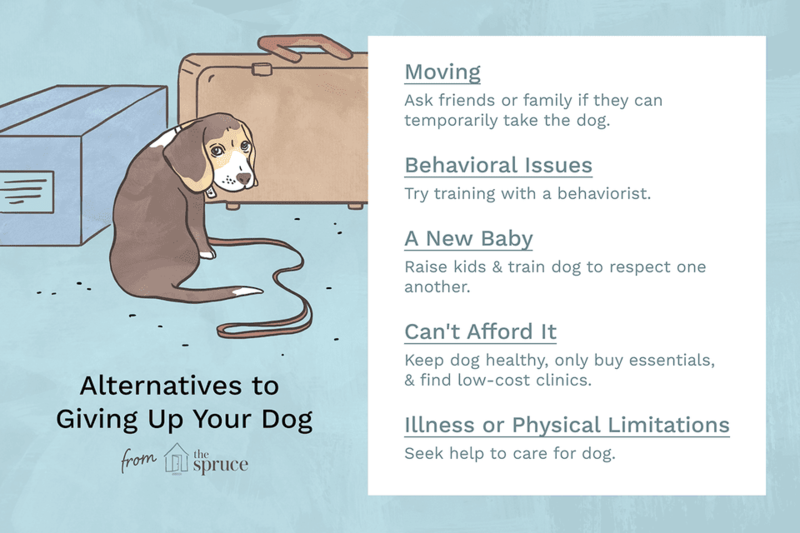 Before you decide to get rid of your dog, please consider some alternatives. Can you try harder to find a pet-friendly residence? Anyone who has tried to rent an apartment with a dog knows it is not always easy. Be diligent and you will most likely find the right place. Try to negotiate the conditions with potential landlords, and be willing to spend a little extra money. If you absolutely must move right away and cannot find a place that allows your dog, talk to friends and family. Someone you know might be willing to take care of your dog for an extended period of time while you search for other arrangements. The same applies if your move is temporary and dogs are truly not allowed. Health problems happen from time to time. If your dog has a chronic illness, it is your duty to help manage it. Find a veterinarian who understands you and your dog. If current therapy is not working, ask for a referral to a specialist or get a second opinion. Tell your vets that you are at the end of your rope and you need help. Behavior problems can be extremely frustrating. In general, our dogs act the way we train them to act, so it is our responsibility to deal with behavior problems. Of course, there are plenty of dogs with behavior problems that were caused by past history or unknown reasons. However, when you take on the responsibility of a dog, you need to take the good and the bad. Talk to your vet to rule out a health-related cause. Then, find a trainer or behaviorist. If you cannot afford this, learn about dog training on your own. Talk to anyone who will listen; you may find someone else who has experienced the same problem. All of this being said, there are some dogs that have health or behavior issues that cannot be resolved. It's important to exhaust all options when trying to help your dog. Dumping a troubled dog on someone else is never the answer. However, carefully rehoming may be possible. In some of the most severe cases, professionals may advise you that the most humane thing you can do is euthanasia. This is, of course, the last resort and something that should only be done after you have tried everything. Congratulations on your happy news! However, you don't need to give up your dog because of the new baby. Growing up with a dog is great for children. In fact, evidence suggests that early exposure to dogs can prevent the development of allergies in children. Dogs and kids can be a great combination if handled correctly. It is essential that your dog is properly trained and exposed to babies and small children before your baby is born. Then, be certain to introduce the baby to the dog appropriately. Plus, it's important that you raise your children to respect dogs. Make sure you include your dog in as many family events, outings, and gatherings as possible. If your dog knows his place in the family, you can have a safer, more peaceful family unit. Your dog and your kids must understand how to act appropriately around one another. If done right, growing up with dogs is one of the best gifts you can give a child. Financial struggles can happen to anyone, and it's understandable that affording your dog can become very difficult. Learn about the cost of dog ownership, then make a budget that includes your dog’s necessary expenses to determine if this is truly the case. You may find that you can afford your dog after all, especially if you make wise choices to save money on dog care expenses. To lower long-term expenses, do everything you can to keep your dog healthy. A nutritious diet, regular exercise, and preventive veterinary care all play major roles in keeping future costs down. Search for money-saving tips to help you pinch pennies. Visit low-cost clinics for routine vaccinations. Contact the Humane Society or your local animal shelter. Or, ask your local pet supply store for information. Resist the urge to buy extras such as a new collar, dog bed, or bag of treats. Make your own dog bed or ask a friend for help. Learn to make dog supplies instead of buying them. You can also offer your dog carrots or apples as snacks, or make homemade treats. Don't stop giving heartworm and flea prevention. Instead, shop around for discounts (but make sure the products are legitimate; ask your vet before you buy). Don't feed generic/economy dog food just to save money. Low-quality diets can cause poor health in the long run. If you cannot budget for premium dog food or a holistic/natural diet, consider a homemade diet. Ask your vet for recommendations. A quality diet doesn't have to be expensive. This is a very understandable reason to give up your dog, but there may be other options. Turn to your family and friends for help. Your dog will most likely be a comfort to you during your illness, so it will be beneficial to keep him around. Some cities and towns have outreach programs where volunteers come and care for the pets of sick owners. Contact local animal rescue groups for suggestions. If you are the caregiver of a dog owner who must enter a nursing home or similar facility, consider keeping the dog yourself or placing the dog with friends or family. More and more care facilities understand the positive impact pets can have. Some allow pets to visit or even live with residents. It will not be easy, but sometimes the only option is to give up your dog. Be sure that you have truly explored all avenues before you make a final decision. Millions of dogs are euthanized each year because of overcrowding in shelters, so try not to contribute to that number. Abandonment is NEVER acceptable (and it's illegal). You are responsible for finding the best home possible for your dog. Make sure you have all of your dog's medical records and any other important paperwork (like microchip information or breed papers). Some animal rescue groups will accept dogs under certain circumstances. You may be expected to pay a fee in some cases. Some groups require dogs to be up-to-date on vaccines and in good health. Make sure your dog has been to the vet recently and that you follow the vet's recommendations. If you cannot find a home, foster arrangement, or rescue group that can take your dog, you may need to surrender your dog to the local public animal shelter or to animal control. Be aware that many dogs do not get adopted from these shelters and can end up being put to death. This should be your last resort.